Details: Messrs Sotherbys have attributed this very fine portrait of a lady in a painted oval to John Riley (1646-1691). John Riley (1646-1691) was considered to be one of the two best portraitists of his time. Born in London where his father was Lancaster Herald, he studied under Isaac Fuller and Gerald Soest and was influenced by Lely. He quickly built up a good practice with the middle classes and took over Lely’s mantle in 1680 when this great portraitist died. He and Kneller were jointly sworn and admitted chief painter to the King (Charles II) in December 1688. Sadly, he died only three years later, otherwise he could well have eclipsed Kneller. Amongst his pupils and assistants were J. B. Caspars, Jonathan Richardson and Thomas Murray. This portrait has been attributed to Riley by Messrs Sotheby’s. 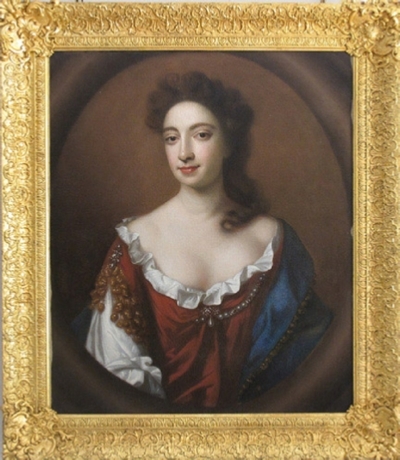 It shows the clear influence of Lely and depicts a lady aged about 20. From the style it dates from between 1685 and 1690. An 18thc label on the stretcher states that the portrait is of Mary Ibbetson, daughter of Joshua Ibbetson, Mayor of Leeds, who married William Milner. Burke’s Peerage 1930 edition under “Milner” on page 1675 states that “William Milner, of Nun Appleton Hall , Easington Hall, Beeston Manor and Bolton Percy, Yorks, Mayor of Leeds 1697, born 1662, married Mary, dau of Joshua Ibbetson, (also) Mayor of Leeds”. On the law of averages the marriage would have taken place around 1685. Riley’s portrait is of about this date and could well have been a marriage portrait. The eldest son of this marriage, Sir William Milner, was created a Baronet in 1617. This was when King James I, anxious to replenish his coffers, created a new Order of Chivalry, the Baronetage. Effectively, these could be purchased, and it seems likely that Joshua Ibbetson and the elder William Milner, who were both wealthy men, produced the purchase price for their eldest grandson. Later he became MP for York (1722-34) and subsequently was Grand Master of the Freemasons. The family line has continued to this day, though the 9th Baronet moved to South Africa after the Second World War. The present, and 10th Baronet, still resides at Constantia, Cape Province. It is thought that Riley’s portrait of Mary Milner was disposed of by the family when the 9th Baronet moved to South Africa.